By its very nature, Alaska conjures up images of adventure and rugged independence. After all, this is America's last frontier -- the "great land" as the native Aleuts called it. So, in planning our family's escape into the wild, we knew we didn't want to see Alaska with hordes of other visitors. We wanted a unique vacation experience that gave us the freedom to design our own trip and see Alaska in a more unique, personalized way. We wanted to get out and immerse ourselves in the wonders of Alaska, not simply just tour it or see it while trapped on the other side of the glass. For families who want to see a lot of Alaska in a relatively short period of time, designing the perfect trip can be tough. After all, Alaska is approximately 586,000 square miles in size and includes 19 awe-inspiring national parks and 100,000 glaciers. Luckily, Gray Line of Alaska's "Alaska by Car with McKinley Explorer" package fit our needs perfectly. Its "have it your way" approach provides a rental car for independence, accommodations, several excursions, and domed-car train travel for sections where you need to cover a lot of ground, eliminating the excruciating "are we there yet?" scenarios. Gray Line of Alaska's car and train itinerary allows travelers to fly into Anchorage, pick up a car the next morning and drive south along the Kenai Peninsula to Seward. 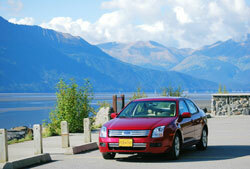 Guests spend one night in Seward and then continue on to Talkeetna and Fairbanks where they turn in the car. A two-day glass-domed railcar train ride from Fairbanks to Anchorage, including an overnight stay in Denali, completes the trip. Since we were flying into Anchorage from the East Coast, we added an extra night and rental car day at the beginning of our tour to give us more time to see the sights around Anchorage and adjust to the time zone difference. That worked out well, as it gave us the chance to view gigantic vegetables (such as the prize-winning 87.7-pound cabbage and 105.9-pound kale) at the Alaska State Fair, tour the nearby Musk Ox Farm in Palmer, and take a dog sled ride at the Iditarod Trail Sled Dog Race Headquarters in Wasila. All of these activities are kid-pleasing family favorites. The next morning, we left the Westmark Anchorage Hotel early for our drive down the stunning Kenai Peninsula. The two-lane Seward Highway has been named a National Scenic Byway for good reason. The abundant wildlife and spectacular views of Turnagain Arm, Cook Inlet and the Chugach Mountains had us constantly stopping for closer looks and photos as we drove. Making our way along Turnagain Arm, a large body of water extending into Cook Inlet, we stopped to see pods of beluga whales, take pictures of Dall sheep posing on the rocks next to the highway, and watch sea otters frolicking in the water. In Girdwood, we stopped for breakfast at The Bake Shop and went on to visit the nearby Alyeska Resort, a year-round retreat capped by Alyeska Mountain. The Alyeska Resort Aerial Tramway operates during the summer and the ride to the observation deck on Mt. Alyeska is not to be missed. This is an excellent spot for hiking and taking family photos, not to mention taking in the breathtaking views of the majestic mountains and hanging glaciers. Next, it was on to view the blue ice of Portage Glacier on the mv Ptarmigan. Gray Line of Alaska included this tour in our package and we found it to be an excellent addition to our trip. This small boat tour on Portage Lake is a perfect excursion for families, as it offers a quick cruise to a close-up encounter with a huge glacier. The blue ice is particularly captivating for children. On our exit from Portage Lake, we made a u-turn at the Williwaw Fish Viewing Platform to see salmon traveling up the creek to spawn. We lingered there for quite a while, watching the bright red fish splash, jump and fight the current on their way upstream. 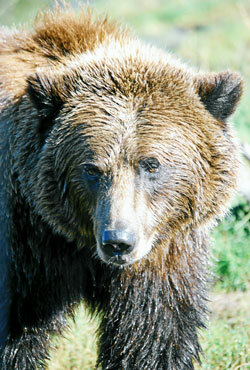 Just one mile from Portage Glacier is the Alaska Wildlife Conservation Center, a must-visit attraction for families. This Center provides a permanent home for orphaned and displaced animals that cannot be released into the wild, including black bears, brown bears, grizzly bears, moose, elk, musk ox, coyotes, bison, and caribou. At the Wildlife Center, families can view Alaskan wildlife up close and amateur photographers have the chance to take exceptional pictures of the animals in natural surroundings. As at Williwaw, this was one of the many places that we were happy to have our car, as we could stay as long as we liked. It was hard to tear ourselves away from watching the brown bears cavorting and wrestling with each other in the water. Our drive down the Kenai Peninsula was filled with stops to take in the mind-numbing beauty that is Alaska. Glacier capped mountains reflected in crystal clear lakes, roadsides lined with fireweed, and occasional waterfalls surprised us at every turn. 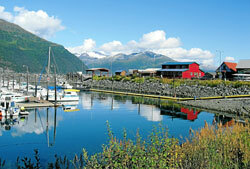 Our drive ended in Seward, a small fishing village located on Alaska's Resurrection Bay. We turned off to hike to Exit Glacier and touch the blue ice before checking in to the Edgewater Hotel, a conveniently located property near the Alaska SeaLife Center. Seward is a popular port of call for cruise ships, and the attractions here could easily fill several days of a family's vacation. Our six-hour early morning Kenai Fjords National Park cruise was easily one of the highlights of our Alaska trip. On our journey into the 580,000-acre Kenai Fjords National Park, we saw more marine life than we could have imagined including humpback whales, orca whales, Dall porpoises, bald eagles, Stellar sea lions, harbor seals, sea otters, puffins, and an incredible variety of sea birds. The up-close views of calving glaciers and the Harding Icefield, the largest icefield on the North American continent, were incredible. When we returned from our morning tour, we stopped in to visit the Alaska SeaLife Center before continuing on our drive. The SeaLife Center, a well-executed combination of an aquarium and a science museum, was partially funded from the proceeds of the Exxon Valdez Oil Spill Settlement Fund. The Center allows families to supplement their Kenai Fjords trip with close-up views and interactions with Alaskan marine wildlife. Kids will enjoy watching Stellar sea lions and diving sea birds glide past underwater viewing windows, getting close to comically colored puffins, and seeing Alaskan king crab, deep sea fish and Giant Pacific octopus. The 7-hour drive from Anchorage to Fairbanks would be a killer for families without the stop in Talkeetna, the "Gateway to Mt. McKinley." This tiny town is the main staging area for climbers waiting to begin their Mt. 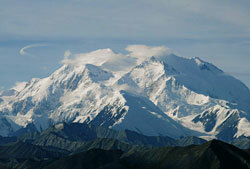 McKinley expeditions and is said to be the inspiration for the Emmy-winning television series "Northern Exposure." This is a great place to get a feel for life in a small Alaskan community. Our base at Talkeetna Alaskan Lodge, with its walking trails and spectacular view of Mt. McKinley, provided the perfect place to relax and unwind. One of the best aspects of Gray Line of Alaska's website is its "gourmet fixings bar" approach to Alaska vacations. Travelers can purchase their "Alaska by Car with McKinley Explorer" trip or any other multi-day vacation, and then add their choice of adventure tour toppings to create a highly customized Alaska experience. Head to the top of the world on a Barrow excursion, view the bear at Katmai National Park, land atop a glacier on Mt. McKinley, go sport fishing or river rafting, take a jetboat tour -- Gray Line makes it all easily available and there for the taking. Talkeetna is a popular departure point for a number of the Mt. McKinley flightseeing tours as well as a number of water-based trips. For us, this tiny town with a trading post and one stop sign was a place to chill out and learn more about Alaska and climbing Mt. McKinley. Over a breakfast of raspberry and walnut sourdough pancakes at the Talkeetna Roadhouse, we talked with waiters and guests at our long table about climbing experiences and other Alaskan adventures. It takes an average of 21 days for climbers to reach the 20,320-foot summit of Mt. McKinley, but only about half of the expeditions make it to the top of the mountain. The pictures and mementos lining the walls of the Talkeetna Roadhouse attest to the difficulty of the journey. We came to the Roadhouse for the authentic atmosphere, but stayed for the food. Before leaving, we grabbed a few raspberry and blueberry scones for the road. The greatest regret of our trip -- we should have taken along the blueberry pie with us as well. The stretch of George Parks Highway from Talkeetna to Fairbanks is long and diverse, but we broke it up with a variety of experiences. The views of Mt. McKinley are rumored to be breathtaking, but the mountain was swathed in clouds that day. It's important to note that a view of Mt. McKinley is only possible approximately 20 percent of the time during the summer months, so it became our mission to see it at some time during our trip. The terrain alternated between barren sand-colored desert and lush fall colors studded with evergreens. It was impossible to know what would be around the next turn. Into the Wild was filmed in this region, and the isolation of the area is easily apparent. We celebrated our arrival at the Westmark Fairbanks Hotel with dinner at the Alaskan Salmon Bake at Pioneer Park, a 44-acre theme park focused around the heritage of Fairbanks. Although it's nothing like Disney World, the Park's many museums and exhibits make it an interesting stop for families. Another of our trip's highlights came that evening, when Mother Nature rewarded us with a spectacular view of the northern lights. Visitors to Alaska can sometimes see the aurora borealis in late August, but it's much more likely during the fall months. We left a request at the hotel's front desk for a wake-up call and were stunned to be awakened by the phone in the middle of the night. This was yet another time when we were happy to have a car on our trip. Although the northern lights could be seen from the hotel, we were able to get the best view from the pullout area by the University of Alaska Museum on the University of Alaska Fairbanks campus. The dancing, shimmering swirls of neon color in the skies were beyond belief. We were told that the aurora could be best be viewed from the dark skies around Ester, but in the middle of the night we weren't quite adventuresome enough to make the trip. Fairbanks is yet another town packed with family adventures. Pan for gold at Gold Dredge No. 8, enjoy a leisurely paddlewheel riverboat cruise, take a trip to see the Santa Claus House and reindeer in the little town of North Pole, tour the University of Alaska's Museum of the North, or experience the extremes of temperature at Chena Hot Springs Resort. After a very successful panning for gold trip to Gold Dredge No. 8 and a quick stop at the Trans-Alaska Pipeline, we headed out to enjoy Chena Hot Spring's naturally heated waters and world-renowned ice hotel. Gas stations are often few and far between in Alaska, and the road to Chena Hot Springs was no exception. The moose along Chena Hot Springs Road were significantly more plentiful than the opportunities to fill up the car's tank. If you go, watch out for wildlife along the sides of the road (and crossing it) and make sure not to ignore those "last gas station" signs. Once at Chena Hot Springs, the "hottest" and "coolest" attraction in Alaska did not disappoint. We basked in the heat of the outdoor mineral hot springs and curled up in an ice bed in the largest year-round ice environment in the world. Upon returning to Fairbanks, we stopped for homemade Alaska blueberry ice cream at Hot Licks before turning out car in at the airport. Rounding the turn, we stopped dead in our tracks. There was Mt. McKinley, out in all of its blazing glory and clearly visible from over 120 miles away. We headed back up to our perch next to the University of Alaska Museum to marvel at yet one more of Mother Nature's wonders before returning our rental car. Clearly, the best was yet to come. For many vacationers, a visit to Alaska would not be complete without a trip to Denali National Park -- and we were no exception. The 4-mile high mountain native Alaskans call "The Great One" was fully visible during our entire rail trip from Fairbanks to Denali National Park. We made our journey aboard the McKinley Explorer, a string of luxurious two-tier rail cars topped with glass domes. The vast expanses of glass allowed us to fully appreciate the magnificent views, but even so, we found ourselves jumping out of our seats and running between cars to snap pictures of moose, trumpeter swans, and looming Mt. McKinley. Because we wanted to see as much of Denali National Park as possible, we scrapped the included Natural History Tour in favor of seats aboard the green shuttle bus to Fish Creek. The day was quite clear and our group was rewarded with a magnificent view of Mt. McKinley at the Stoney Hill Overlook at milepost 62. The fall foliage and colors of Polychrome Pass were also extraordinary. During our long afternoon bus ride, we saw 6 bears, elk, moose, caribou, numerous Dall sheep, a wolf, a fox, a ptarmigan, and several golden eagles. According to our bus driver, that combination of sightings qualified our trip as a "Grand Slam." Snacks, sandwiches and drinks kept us alive on our 8-hour trip, as no food was provided. A kindly bus driver drove us from the Wilderness Access Center to the McKinley Chalet Resort to check in and we went to bed exhausted and happy. Although we enjoyed our 8-hour tour of Denali, it would probably be a bit much for families with small children. Gray Line includes the 5-hour Natural History Tour in its package, but the bus doesn't go far into the park (milepost 17) and even that length of time may be too long for the younger ones. It's quite easy to take one of the green shuttle buses for a short distance into the park, get out and look for animals, and pick up another shuttle bus on the way back. Denali National Park also has an excellent Junior Rangers program for children ages 6-12. Stop by the desk at the main visitors center for more details and information. 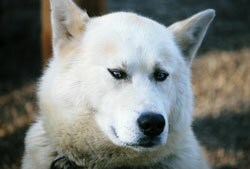 The next morning, we loaded up our luggage, checked it at the Park, and went to visit the Denali sled dogs. We would have loved to have taken one of the exciting Denali flightseeing tours or Nenana river rafting trips, but this free sled dog demonstration offered by the National Park Service fit our budget perfectly. This is an excellent Denali excursion for families with kids of all ages. We went early to visit with the dogs and quickly fell in love with Blue's ice blue eyes and affectionate personality, Beluga's thick snowy coat and photogenic face, and the exuberant excitement of all the dogs in the kennel. After the sled dog demonstration, we had the opportunity to hold cuddly sled dog puppies and pose for pictures. Too soon, we were on our way back to Anchorage and the end of our vacation. The McKinley Explorer railcars made the trip enjoyable and painless. After a relaxing lunch, clouds rolled in and we peacefully dozed off to sleep on our way back. On our last day in Alaska, we found ourselves missing the independence of our trusty rental car. After a quick breakfast at the Snow City Cafe, we snagged a great rental car rate, packed our bags, and headed out on the road again. We made a short visit to the Alaskan Native Heritage Center and then drove down Turnagain Arm one last time to the Anton Anderson Memorial Tunnel connecting Portage to Whittier. This unique 2.5 mile one-lane thruway, the result of a World War II railroad tunnel conversion, is the longest combined vehicle-railroad tunnel in North America. Traffic can only go one way at a time, but if you coordinate your arrival time with the posted tunnel schedule, your wait will be a short one. On the other side of the tunnel, the tiny town of Whittier awaited us. There were no cruise ships docked that day, so we had the whole port practically to ourselves. As we ate our seafood lunch on the restaurant deck overlooking Prince William Sound, sunlight glinted off the water as fisherman reeled in their catch and sea birds circled overhead. We felt completely removed from the rest of the world and reveled the peacefulness of our surroundings. After lunch, we took time wandering through the little shops and the marina before returning through the tunnel to Anchorage and our flight home. That last day represented so much of what I enjoyed about Alaska. The unexpected discovery of something spectacular in the night sky or just around the bend, the spirit of independence inherent in our journey, the majestic and mind-numbing beauty of our surroundings, and the abundant wildlife that encircled us were important and integral parts of our trip. Looking back on our adventure, I'm always amazed that we managed to do so much on that vacation, to customize it and truly make it our own. Sometimes, when I get homesick for Alaska, I find my way to the webcam at Talkeetna Alaskan Lodge and click on it to view the pictures. The top image shows me the current weather, but I always scroll to the bottom for a view to my past -- Denali in the fall, magnificent, wild and wonderful. If life is a journey, I'm glad I did this part of it my way. * Understand Alaska's seasons and take weather into account when planning your family's trip. Days are longest in June and driest in May and June, while records indicate that August and September are the rainiest months of the year. That being said, there are exceptions to every rule. During our trip in late August and early September, we had one very overcast day that included some rain, but it was clear and sunny the rest of the time. 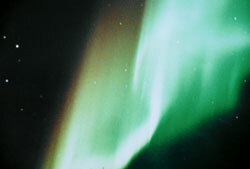 We also were able to view the northern lights during our trip. * Consider adding an extra day at the start of your trip if your family's budget will allow it. This will give you the opportunity to see more of the attractions around Anchorage and adjust for any time zone changes. * Find out what time the Anchorage rental car office opens and get there at least 15 minutes ahead of that time. Rental car offices are usually staffed by one person and long lines form quickly. * Make an itinerary of what you'd like to see on each leg of the trip, but relax and don't stick to a regimented schedule. Here is the itinerary we used on our trip: Into The Wild: An Alaska Family Road Trip Itinerary. Understand that Alaska is nature's own Disney World -- you'll never be able to see everything the first time around. Enjoying the experience and uncovering the unexpected around the bend is half the fun. Make sure to customize your itinerary to your family's interests and children's age groups. Older children armed with snacks and iPods may easily be able to do a long Denali excursion, while other tours and activities will be best for younger kids with shorter attention spans. * Driving in Alaska is an adventure, and easily one of the best ways to experience all that Alaska has to offer. While on the road, watch out for moose (especially at dusk and at night) and be aware that gas stations are often not as plentiful as in the lower 48 states. * Food in Alaska is expensive, so make sure to budget accordingly. There are a few fast food outlets along the road, but we enjoyed discovering the foods and flavors of Alaska at a number of restaurants along the way. Some of our favorites include Snow City Cafe, The Snow Goose, and Simon & Seaforts in Anchorage; Ray's in Seward; Summit Lake Lodge at Moose Pass on the Kenai Peninsula; Talkeetna Roadhouse in Talkeetna; and Pike's Landing and Hot Licks in Fairbanks. * Bring along layers of clothing to accommodate Alaska's swings in temperatures, as well as rain gear in case it gets wet. * For more information about the Gray Line of Alaska ""Alaska by Car with McKinley Explorer" trip, contact Gray Line of Alaska at 888-452-1737 or 206-281-3535, visit their website at www.graylinealaska.com or contact your favorite travel agent. 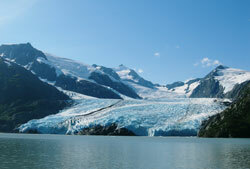 Gray Line also offers a number of other tours in Alaska ranging from day trips and cruise connections to multi-day itineraries.